As a longtime small biz owner & freelancer, I LOVE supporting others. I’ve run six of my own freelance small businesses over the last 15 years. Before that, I worked for small business owners. And before THAT, I was raised by a small business owner who made SURE that I understood EVERYTHING about the damn write-off receipts. And you know what? I love being a small business owner, and no matter what other ways I work, I will always run a side gig. (Like this one). It’s in my blood, and the money part is easy for me. So, let me help you — so you can spend as much time as possible DOING your biz and maximizing your time. Running numbers so you (finally!) 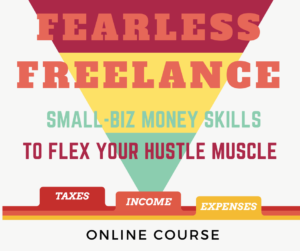 understand how much money your biz is putting in your wallet. Devising and setting up structures to help you see how you can make more money in my business? Setp-by-step support in getting your infrastructure together federally, banking, retirement, etc. When and how will we meet? Sessions are available: Mon – Thurs 6:30p EST – 10:30p EST, and Sundays 2p EST – 11p EST. You’ll choose the time that works best for you when you book. Our meeting can be done in person in Brooklyn, NY or via a Zoom video call. After or when you book your first appointment, you’ll be invited to fill out a coaching intake form. From the info in that, you’ll be given optional customized prep work for the appointment. I recommend booking an intake at least a week out so you have time to do any prep work and ruminate on the work beforehand. What happens at an appointment? What’s the approach? My coaching practice is informed by agile design, a trauma-informed approach and consists of strategic, laser-sharp, compassionate financial education customized to you. When is this not a great pick for me? Are you trying to start a C-Corp – a business that you hope to sell to shareholders someday? While I can support you at a high level, me and everyone else is going to send you to a lawyer for the heavy lift. Do you need someone to actually do your taxes? Then you need an accountant or a tax preparer. I can tell you exactly how to manage your money so when you get there the taxes part is less painful/annoying/confusing – but I don’t give tax advice or do taxes. Are there four or more of you? Are you trying to do something relatively complex like build a mutual agreement on cost-sharing for a compound you’re buying or a cooperative business buy-in/sweat equity model? Are you actually looking to get an educational workshop together for multiple members of your group? For larger group work that you think will need more than two hours to be effective, check out the Intensive Co-creation group workshop plan.